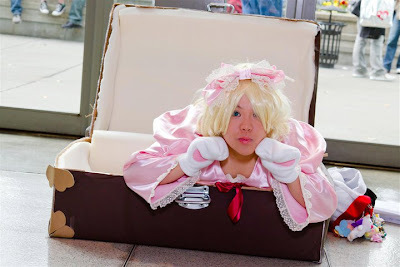 So for those who have seen me cosplay before will notice I like to cosplay from RozenMaiden, and often known as the "girl with the box". Basically I'm a victorian doll and I sleep in my doll case. Through the years I have made several Rozen Maiden outfits (different characters from the anime). This year was time for me to do Hinaichigo. I dont really like her character because she's that annoying toddler who acts like a total brat. Oddly this was one of the funnest to do. Besides sitting in in the brief case like I had done in many years prior. I put on cat ears and paws. I'm not a Neko, but Hina is cosplaying a Neko (emphasis on that the doll is cosplaying but making the paws obviously gloves). This is because there is a popular episode in which she dresses up as a Neko. Also Hina, being a toddler likes to draw, although she doesn't well. So I grabbed a box of crayons and drew pictures for people. I made sure to make the pictures as childlike as possible. Here I met a Shinku, so I drew a picture for her while she drank her tea. Here's another picture I drew for some photographers.